Recuperate Herbal Supplement for Cats | Elk Velvet Antler | Wapiti Labs, Inc. Naturally supports the body’s normal inflammation response. Leg and foot injuries are among the most common trauma in cats. Our Recuperate liquid supplement is a traditional Eastern Medicine herbal formula that supports the natural healing process and normal recovery time. Available as concentrated liquid formula. There are no synthetic ingredients, and we use a proprietary process that allows us to retain key organic compounds and nutrients. Help Your Cat Breath Easy! 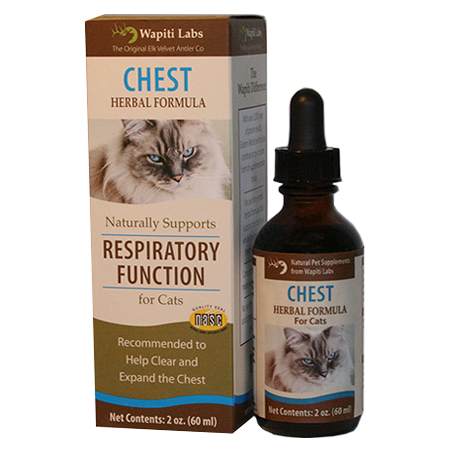 Keep your cat happy and healthy – try Wapiti Labs’ Chest supplement today! Your Cat’s Health is Vital to His Happiness! There’s never been a more vital time to make your cat happier with supplements from Wapiti Labs!